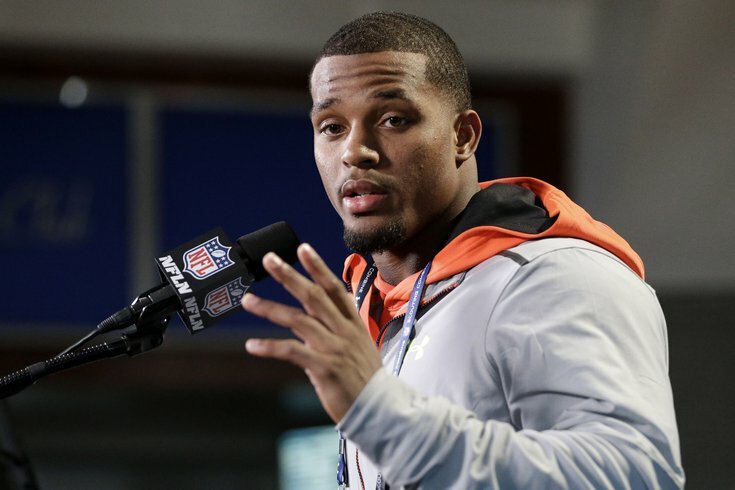 Nebraska running back Ameer Abdullah answers a question during a news conference Thursday at the NFL Combine in Indianapolis. During his Combine interview with the media, some reporter asked him a random question about Patriots RB Shane Vereen. Abdullah was armed with a great answer. "I watch a lot of his film to help myself out with route running," said Abdullah. "He runs the best option route in the NFL right now. He does a good job of stemming the linebackers, snapping them off, and using his head (demonstrated a head juke) to get separation, (and he has) outstanding hands." Vereen had a mere 838 yards from scrimmage and 2014, and Abdullah was able to give a thorough and accurate scouting report on him. Last offseason, Eagles WR Jordan Matthews requested game film of the corners he was going to face in advance of the Senior Bowl, and he did homework on the Eagles' offensive scheme in advance of meeting with Philly. #Culture. • On-field workouts begin today, beginning with offensive linemen and tight ends. Make sure you check out our OL-TE preview of players to watch who could be of interest to the Eagles. • Delaware TE Nick Boyle met with Eagles tight end coach Justin Peelle. Boyle's offensive coordinator, Sean Devine, worked with Chip Kelly at New Hampshire, and Boyle said that a lot of Delaware's plays were based off of Kelly's plays. With the Eagles releasing James Casey, a spot opened up at tight end if the Eagles want to carry four of them again. • One of my favorite quotes of the day came from Georgia RB Todd Gurley, who was talking about his ACL tear, and where he was at in his recovery. Gurley started his answer by saying "The timetable is six to nine months," and then ended it with, "But I'm not going to give a timetable." • There's a guy here who is asking every offensive linemen within earshot how they're going to block Ravens pass rusher Elvis Dumervil. It's such a weird, specific question. • Marcus Mariota gives one hell of a boring interview with the media, but the buzz here is that he's killing the interviews with NFL teams. • UCLA QB Brett Hundley seems to want to play for the Eagles. He said that the Eagles' scheme most resembles what he ran in #college. • Alabama RB T.J. Yeldon spoke with the Eagles. Yeldon is a big boy at 6'1, 226. I get the sense that Chip Kelly would prefer a bigger back who gets it and goes. Yeldon could be a player of interest on Day 2 of the draft. Round 3, maybe? Considered a problem child at Missouri. Suspended twice by Missouri and arrested twice for marijuana-related incidents. Kicked off team at Missouri in April 2014 after details of his alleged role in an alleged burglary were released by Columbia, Mo., police. He allegedly shoved a female student down some stairs during the alleged incident, but no charges were filed. Missed entire 2014 season. Calvin Johnson ran a 4.35. We'll see what Green-Beckham runs on Saturday. • The Seahawks don't sound like they're going to be able to keep CB Byron Maxwell. "Byron is one of ours, it’s just it would be hard to see him leave but I would think his market will be very strong," said Seahawks GM John Schneider. "He’s a heck of a kid, a heck of a player but we are going to keep doing things the way we stared here. Just keep drafting people and playing young people and trying to keep the players that we can keep, try to identify the players that we have to reward and make those tough decisions about players that are under contract that you may have to let go to create some cap room. Those are just tough decisions as you go. We are not going to change anything we do and so if Byron does move on, we’ll hopefully have another young Byron Maxwell out there. He’s a great guy." Maxwell is an obvious free agent target for the Eagles. • I don't know squat about Prairie View A&M QB Jerry Lovelocke, but his measurements are great. He is 6'4, 248, and his 34 1/4 arms and 10 1/2 hands are the biggest among the quarterbacks here. • As noted above, the Eagles released TE-STer James Casey. The only surprise there is that Cary Williams didn't get cut first.